The senior demographic is simply massive and will grow considerably in the coming years. As millions of Baby Boomers retire worldwide, there will be a simply tremendous additional demand for certified fitness instructors who are qualified to assist seniors. The unprecedented demographic shift will add to what is already a very hot industry. With that stated, it is important to note that the versatile nature of water aerobics is such that all kinds of people of varying ages turn to this form of physical activity for their fitness needs. Through the Personal Training Certification Institute, you can gain the knowledge and credentials you need to start a career in this ever-growing niche. While a favorite among the elderly, water aerobics is not only for that demographic. Anyone can take advantage of the considerable health benefits that this safe and low impact activity has to offer. Water aerobics is low impact and that makes it ideal for those with injuries as well as seniors. With Water Aerobics Instruction Certification, it is possible to help people improve their flexibility and balance and do so in a very safe fashion. There are distinctive additional advantages to gaining your Water Aerobics Certificate. Water aerobics allows you to instruct several people at once and that makes it a uniquely attractive earner. Since water aerobics is very low impact and yet still offers considerable aerobic and strength gaining benefits, people across the age spectrum are potential clients. In your Water Aerobics Instruction Certification program, you’ll learn the very latest facts and safety considerations. 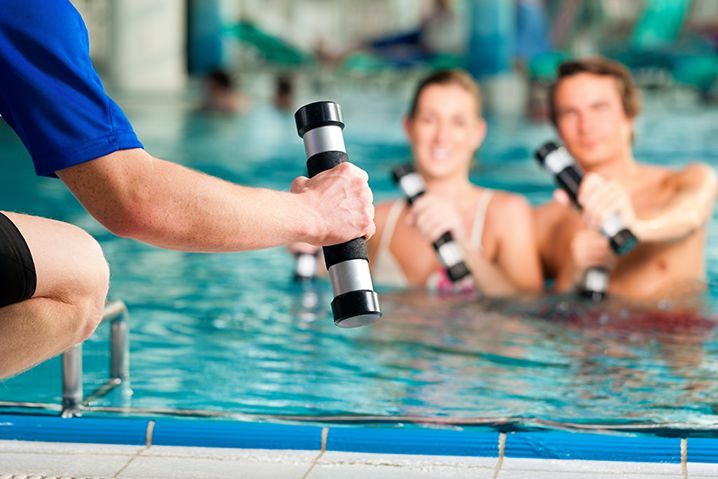 Since Water Aerobics Instruction Certification program was designed and written by experienced certified fitness professionals you can be sure of its effectiveness. This 100% completely online program is designed with your lifestyle in mind. That means there is no classroom time, and you can take your exam whenever you like with zero time limits. It is even possible to print your practice exams, take them wherever you like and then input your answers online later. We have created industry leading practice tests. Our program also offers 24/7 instant certification and instant grading. Once you pass your exam, you’ll receive a free instant email certification and a full 8 hours of continuing adult education credits. Through our Water Aerobics Instruction Certification Course, you’ll learn how to help your clients get fit and stay fit. Get started today and open up a range of new career possibilities.